More pictures from Paris, as promised, with a little educational material thrown in for good measure. 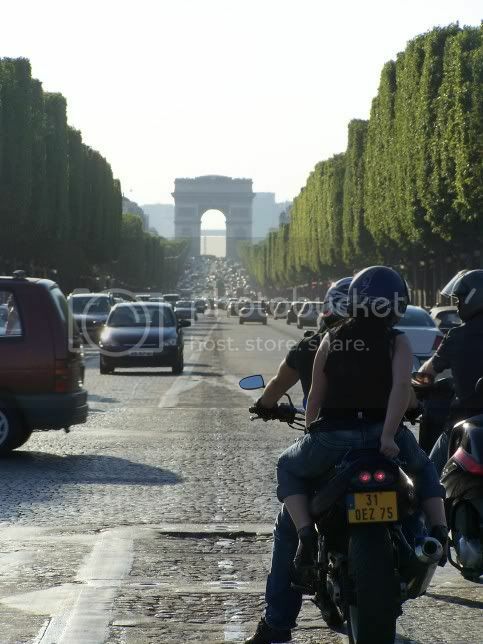 This was taken at about 8:30 in the morning, looking Northwest from just off the Champs-de-Mars. You can see the Palais de Chaillot situated across the River Seine beneath the Eiffel Tower. The famed Trocadéro Fountains weren't operating at the time. 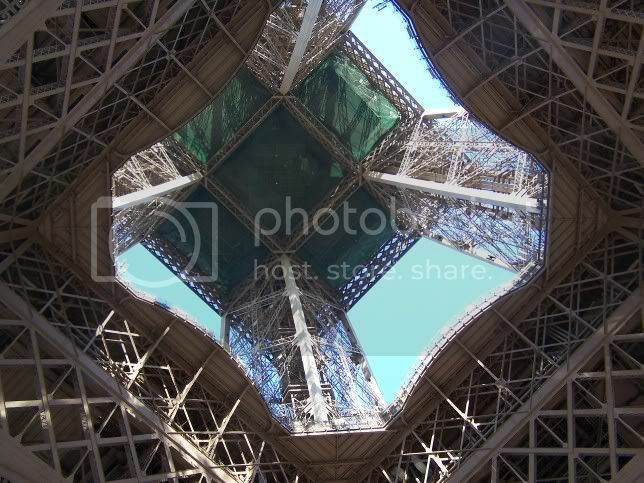 Looking straight up from directly beneath the tower. 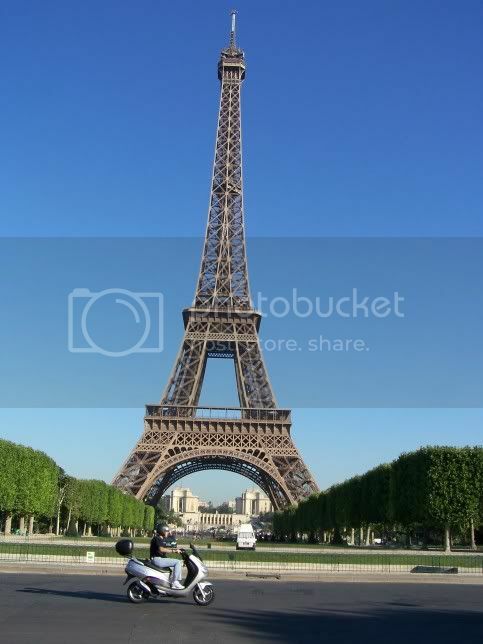 1063 feet tall, there are 347 steps to the first level and 674 steps to the second level. I did not take the stairs. Access to the very top is restricted, so I only got as high as the second level, which is some 376 feet up. 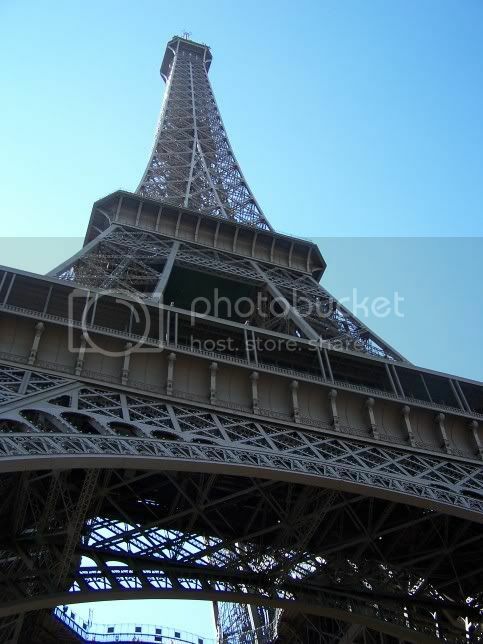 2.5 million rivets hold the tower together, which is painted a color similar to milk chocolate every seven years. The Tower opened at 0900, but I got there a good twenty minutes early, so the line was surprisingly short, although it was much, much longer by the time it opened, and longer still an hour or so later when I left. The Champs-Elysées looking back toward the Arc de Triomphe, which was built to commemorate Napoleon's victory at the Battle of Austerlitz in 1805. The Champs is a shoppers paradise, but only if you have deep pockets. Amongst the shops, movie theaters, restaraunts (including a McDonalds with the only white arches in the world), you can even find car dealerships, which made me wonder how you could take something out for a test drive when the inventory only consisted of what was on the showroom floor. One of the highlights of the trip, and where I intend to spend more time next time I'm in Paris. 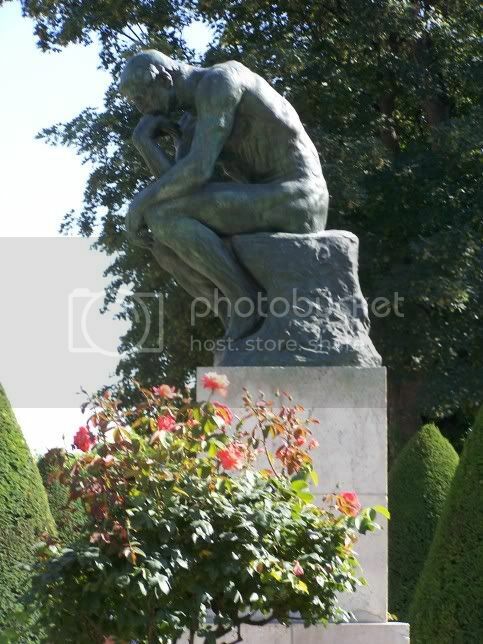 Rodin's The Thinker contemplating a thorny issue. If you're into sculpture and art history, the Musée Rodin is one of the stops you have to make when you're in Paris. Auguste Rodin was widely regarded as the greatest 19th-century French sculptor, and his former home is now a museum to his works. While much of his work looks unfinished, the finished items in the gardens surrounding his home are quite impressive.